Who you really really are? how to realize our distinctive identity. In art we all strive to express ourselves. To find an original point or perspective. when this is what a sneakers ad tells you? or is having an identity just a fashion? or do we mold like the fabric on and of our bodies? actually repeats, without delivering the denouement? How to call out when everybody screams? How to declare emergency, when crisis becomes normalized? but can we take them off? or is it future that drags our present into its prepackaged set. like chatbots and avatars we follow our fake me. when everyone is a microcelebrity? options and threats, have switched their places? or do we simply FAKE the ME to make it? People always tell you, ‚Be humble. Be humble.‘ When was the last time someone told you to be amazing? Be great! Be great! Be awesome! Be awesome! How to find our place in constant circulation? 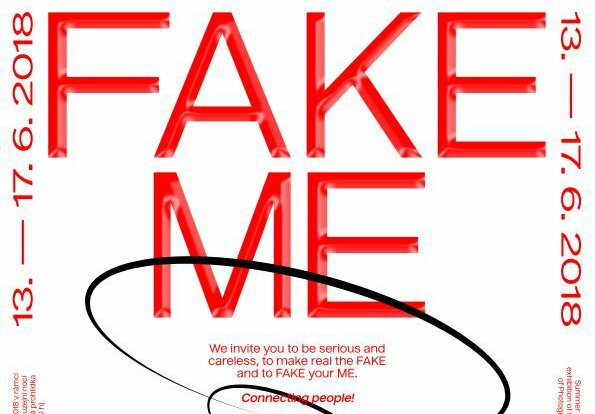 Is your me fake or the other way round we need to fake it to make it. Be yourself! – Because You’re Worth It! – Just Do It! – Think Different! – Have it your way! – Share the Fantasy! – It is. Are you? – I think therefore IBM! What do we want from art? What do I expect from you? What do we think about millenials and current generation of youngest artist? How do they see their prospectives, how do they form their possibilities and identities? Our exhibition gathers not only students of photography at FAMU. But also respective group of artist connected not only by their conditions but also in the way they address them. Presented artist struggle with their account of identity and community. Rather then in reflecting or engaging with critique of current problems, they try to articulate their own problems with surveilence, consumerism, selfpresentation online or their relation to traditions or roles. everyone will say he needs to learn how to act. At home parental acting classes are one of the first steps to us loosing who we really are to „the simulation“. Parents are our first acting coaches.